-that is immortality enough for me. 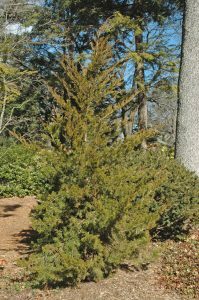 In many an old country graveyard, even those with few trees, one may still come across Juniperus virginiana, Eastern redcedar, its evergreen leaves perhaps once providing a metaphor for eternal life. 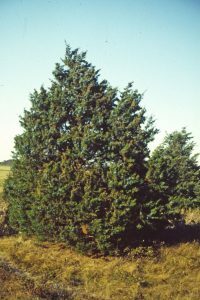 Native from southern Maine to the Badlands of South Dakota, and south to eastern Texas, and back up through the higher Appalachians, this is a small to medium sized tree, forty to fifty-feet tall at a maximum, but often half that size. 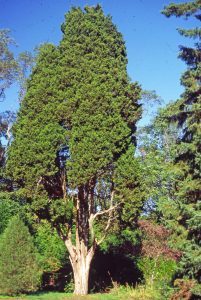 Despite its common name this is yet another tree that is not a true cedar, or Cedrus, but rather a juniper. 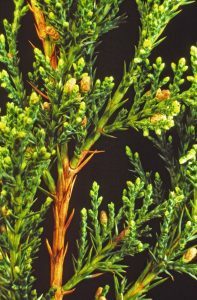 Nonetheless as a pioneer species, early to sprout in abandoned or burned land, this in earlier centuries lived up to a colloquial phrase of being almost as common as dirt. 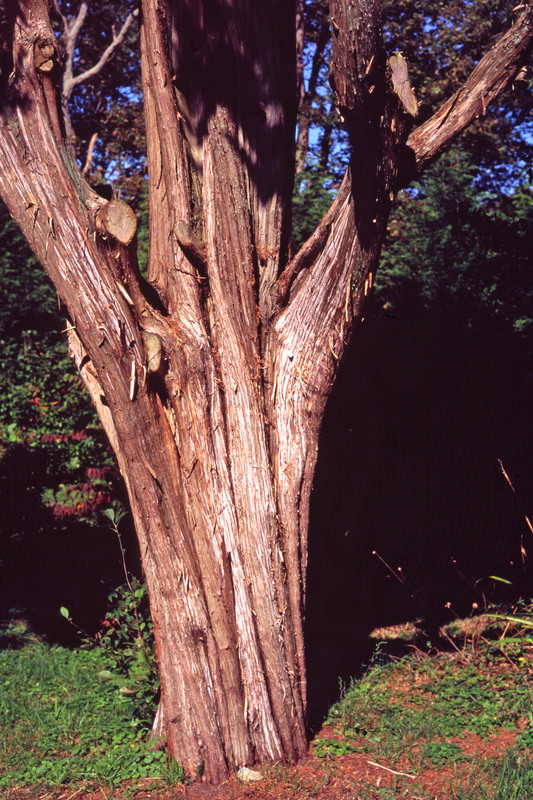 After Europeans arrived in North America they began extensively using this wood, which shrinks little, is easy to split, and somewhat resistant to decay, for shingles, fence posts, buckets, tubs and coffins among other objects. Also used for log cabins, furniture, planking for boats, during Colonial times this became an economic export. This aromatic wood was also found to repel clothes moths and frequently was used to line closets and create drawers and chests. During nineteenth-century America most pencils were made from this wood which does not splinter when sharpened. Henry David Thoreau (1817-1862) spent many days working with Juniperus virginiana wood in his family’s pencil factory in Concord, MA. Since the mid-twentieth century, with reduced supply and for other reasons, most pencils have instead been made from incense-cedar, Calocedrus decurrens, of the American West. Horticultural usage of Juniperus virginiana may also be traced back to Colonial times where this evergreen with an upright habit often found use as a wind break or hedge. In that era of plant exploration and discovery, we briefly recall John Bartram (1699-1777). Bartram, of Philadelphia, who has been referred to as the “father of American Botany,” is famous for his plant collecting throughout eastern North America, from the shores of Lake Ontario, to northern Florida. Carl Linnaeus (1707-1778) called Bartram the “greatest natural botanist in the world.” Bartram’s plant collections were sold domestically as well as in London. Among some of his British customers was Robert James Petre (1713-1743), who was planting an “emerging American Forest” at his estate Thordon in Essex. Andrea Wulf in her The Brother Gardeners recalls, “There were 230 scarlet oaks, 120 American sycamores and 69 tulip poplars intermixed with 1,100 three-year-old Juniperus virginiana, which Petre had raised from Bartram’s…” George Washington (1732-1799) at Mount Vernon, Thomas Jefferson (1743-1826) at Monticello and Andrew Jackson (1767-1845) at The Hermitage were a few of the many others known to have planted Eastern redcedar. Contemporary landscape practices grew to eschew this as too common-place, some even denigrated it as being weedy. 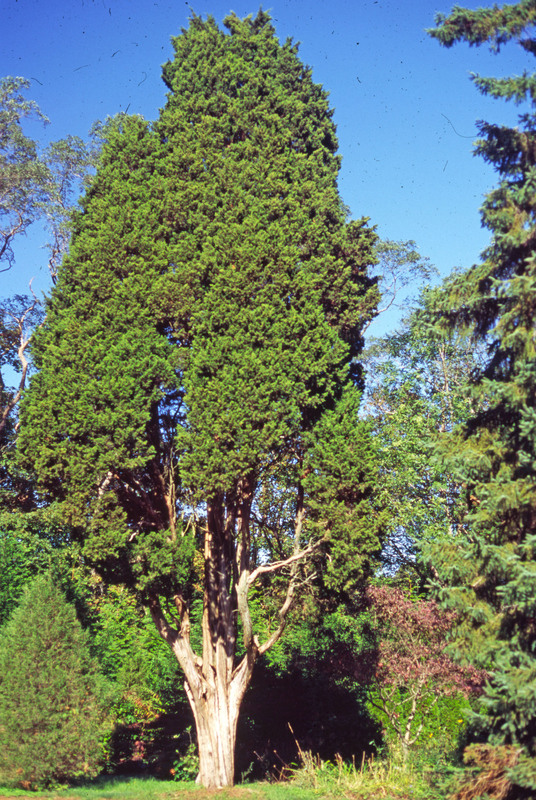 Noted plantsman, author and director of a university botanic garden, J. C. Raulston (1940-1996) was one who admitted to reevaluating the merits of Eastern redcedar. Stating that this was a tough, dependable plant, he shared a question he used on a university final exam, “Name a tree that meets the following requirements: Can be grown from USDA Hardiness Zone 2 through Zone 9, is evergreen and has attractive fruit, tolerates drought and high or low ph soils whether loose and gravelly or compacted, has minimal pest problems, tolerates beach conditions, is easy to transplant and establish in the landscape, grows rapidly when young and is long-lived, tolerates high winds, and has a solid root system to prevent wind throw.” As for being long-lived, one in West Virginia has been reported to be 940 years old. 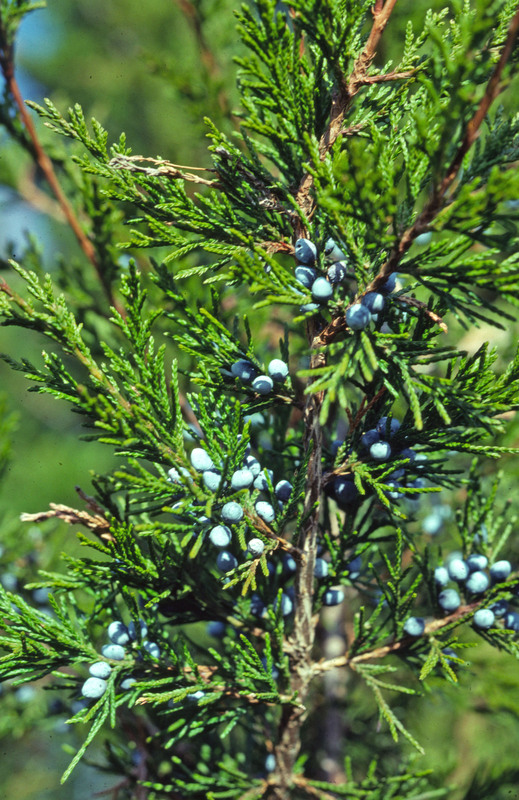 These berry-like cones are eaten by an extensive list of bird species. Richard DeGraaaf in his invaluable Trees, Shrubs & Vines for Attracting Birds includes Yellow-rumped warbler, common flicker, evening grosbeak, hermit and Swainson’s thrush, brown thrasher, cardinal, mourning dove, kingbird, eastern bluebird, eastern phoebe, mockingbird, purple finch, alder flycatcher, along with robin, sparrow, starling, crow, tree swallow, turkey, ruffed grouse, pheasant and cedar waxwing. Charles Fergus states in Trees of New England that, “The cedar waxwing was given its name because of its liking for red cedar berries; a flock of those social birds can pick a large tree clean in a few days.” Research cited by Fergus, conducted by a Virginia biologist, Anthonie Holthuijzen, found that it takes twelve minutes for a red cedar seed to pass through a waxwing’s digestive system. Benefits for the birds are re-compensated to the trees as the digestive process rendered the seeds three times more likely to germinate than seeds that had simply fallen to the ground. 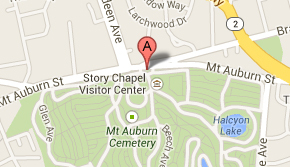 Many birds also nest and/or roost in the dense foliage of these trees. Rabbits, raccoons, skunks, coyotes and foxes among other mammals also eat these fruits. nightfall, wobbling, piping, wounded with joy. So with thoughts of horticulture, ornithology or perhaps martinis, on your next visit to Mount Auburn look for the approximately eighty Eastern redcedar species or cultivated varieties thereof we have growing throughout our living collection. As a plant pathologist, eastern red cedar is important because it is one of two hosts required to complete the life cycle of cedar apple rust, caused by the fungus Gymnosporangium juniperi-virginianae (which should be italicized!) Where apples or crab apples are grown near eastern red cedar this pathogen can cause production of large red-brown galls on the red cedar trees that produce bright orange, gelatinous “horns.” On the apple or crab apple trees, spotting can occur on leaves and fruit, which make the fruit unattractive and, to some, unsaleable. 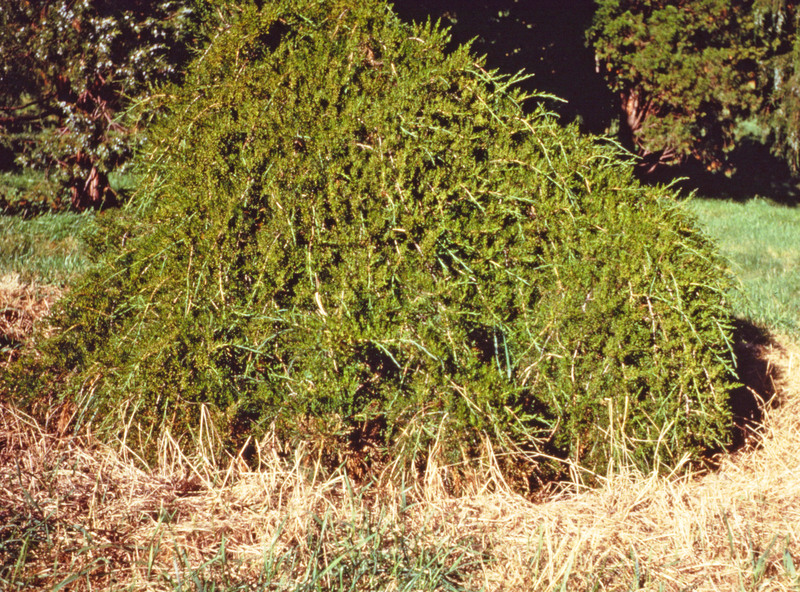 One popular management stragegy for the disease is to remove red cedars growing near apple orchards. Another strategy is to plant resistant apple cultivars. If you have these two plant species in close proximity on your property, do not be surprised to see this famous plant disease some year.